Freechoice: Join a guided walk around Regensburg or take a ferry and sail the Danube Gorge to view historic Weltenburg Abbey, where you can sample beer from one of the oldest monastic breweries in the world. Freechoice: Be guided through Melk’s magnificent 18th century Benedictine Abbey. 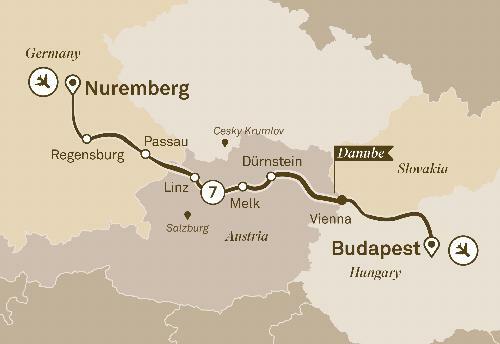 Alternatively, embark on a guided bike ride along the river from Melk to Dürnstein – at your own pace, of course. Or visit a local winery for a guided tour and tasting of its fine wines. Freechoice: Take a guided tour of historic Bratislava or tour Schönbrunn Palace and witness the opulence of the Habsburg Empire. Alternatively, explore this majestic city on a guided cycling tour or visit the Belvedere Museum, one of Europe’s most stunning Baroque landmarks. Discover the greatest collection of Austrian art dating from the Middle Ages to the present day, complemented by the work of international artists such as Claude Monet and Vincent van Gogh. The museum houses the world’s largest collection of Gustav Klimt’s paintings, including the golden Art Nouveau icons ‘The Kiss’ and ‘Judith’. Even so, every aspect of this itinerary will surprise and delight. Embark your 5-star luxury river cruise in Nuremberg. Explore Vienna, with its remarkable array of elegant buildings, or Budapest, one of the most beautiful cities in Europe. You can look forward to enjoying it all from the comfort of a Scenic Space-Ship.